Nearly a quarter of a century after they spear-headed the effort to build the original Joey’s Park, the leaders of that project will share their insights Tuesday night as a new generation of volunteers works to build a replacement playground. Emily Stangle, Louise Dohanian and Sue Guertin – leaders of the 1989 Joey’s Park project – will be the featured guests at a Joey’s Park Community Meeting, which will take place Thursday, May 9 at 7 pm inside the Winn Brook Elementary School cafeteria. 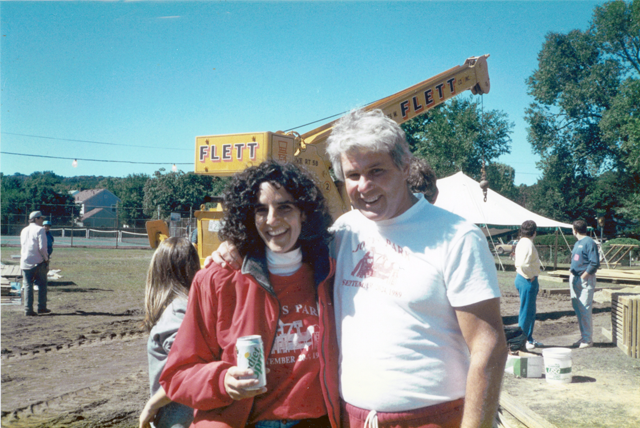 In 1989 hundreds of volunteers came together to build Joey’s Park in memory of Joey O’Donnell. The wooden structure, located on Cross Street behind the Winn Brook Elementary School, must be replaced, and the Friends of Joey’s Park plans to build a new playground this October, once again with help from hundreds of community volunteers.